While many industries in the U.S. have undergone massive changes in the last 10 years, the educational system appears much the same as it did 100 years ago. For the founders of Remind101, a young educational technology startup from San Francisco, there’s no better example than the tools teachers use to communicate with students and their parents. While timely and effective communication is critical to K-12 education, says co-founder and CEO Brett Kopf, schools still continue to use the same old physical intercoms, phone trees and PA systems to communicate with students they always have. And the paper permission slip? Alive and well. Brett and his brother David founded Remind101 to help bridge the communication gap in primary education, offering an easy and safe way for teachers to communicate with students and extend their classrooms. Because text messaging has become the primary mode of communication for most students, Remind101 has developed a mobile platform — with apps for iPhone, iPad and Android — that allows teachers to quickly send reminders to both students and teachers via text or email. Whether these notifications are about deadlines or permission slips, Remind101 acts as the middle man between each group, while ensuring that communications remain secure and private. And teachers seem to have taken notice. Kopf tells us that over 10 percent of teachers in the U.S. are now using Remind101 to communicate, and the startup’s six million student and parent users are on track to send over 200 million messages by the end of the year. Since releasing its mobile apps this year, the startup’s user base has grown exponentially, Kopf tells us, with 30,000 schools now using Remind101’s mobile platform. 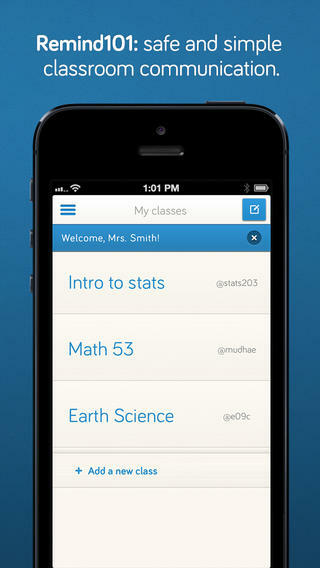 With its growth rate increasing, Remind101 is ready to expand. Today, the startup announced that it has closed a $3.5 million round of series A financing, led by The Social + Capital Partnership, with participation from Yuri Milner, Maneesh Arora and a handful of other angel investors. As a result of the round, Social + Capital founder and manager, Chamath Palihapitiya, will be joining the startup’s board of directors. The new funding follows a $1 million round of seed capital Remind101 quietly raised following its graduation from Imagine K12, where it was part of the education accelerator’s inaugural class. The startup’s seed investors, which includes names like First Round Capital, also participated in its latest funding. With $4.5 million now under its belt, Remind101 will look to continue expanding its current team of 14, as well its product lineup. The startup is currently working on tools that would allow teachers to more quickly upload documents and find workarounds for administrative tasks, like the distribution of permission slips and hall passes. In the big picture, the CEO tells us that he’d eventually like to see Remind101 become the virtual switchboard for all communication that takes place between teachers and students. While this has long been the purview of Learning Management Systems (LMSes), like Blackboard and Moodle, communication channels are just one of the many features offered by these systems today. 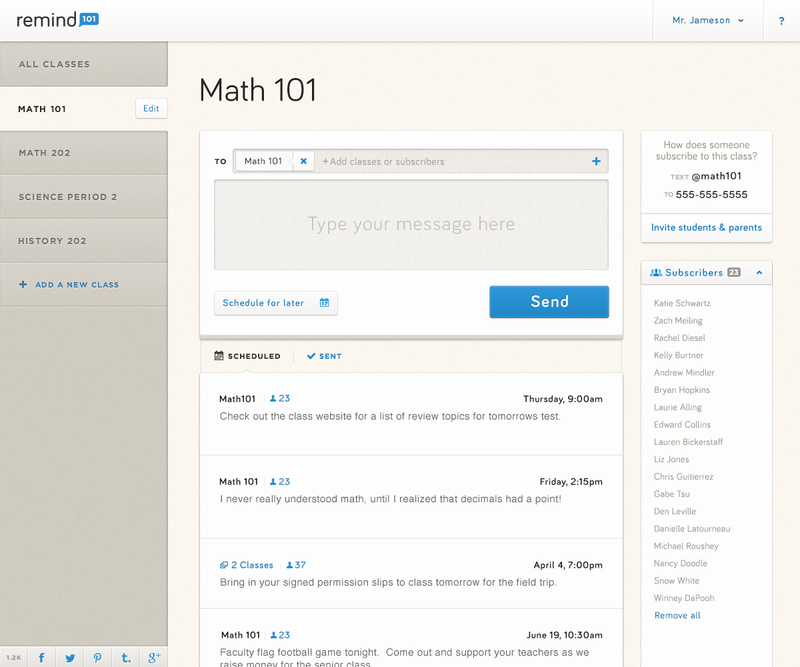 By tackling the calcified parts of teacher-parent and teacher-student communication, specifically, and by focusing on simplicity, Kopf believes that Remind101 can offer a more attractive solution for busy teachers. What’s more, Remind101 isn’t a polling system like Socrative or Top Hat; instead, it allows teachers to fire off messages in real time or schedule them for a later date, either sending quick queries, problem sets, or offering positive feedback at the end of the day. Although teachers need a web-connected device to access Remind101, once they sign up, they can quickly create their own “class,” with the system assigning them a number which they can then offer to students and parents. Once parents and students text that number, they’re in, and that’s all the work that’s required. Students will never see the teachers’ cellphone numbers and vice versa, the founders have built the system to ensure privacy in that regard, while still allowing teachers to send out a single message to every subscriber, and create multiple classes and groups. Although the Kopf brothers aren’t teachers themselves, nor do they come from academia, what success they’ve had thus far, they attribute to working closely with an advisory board of 70 teachers, which hail from across the educational system, from primary to higher education. Of course, that’s probably also why Remind101 is completely free to use, though now that the startup has quite a bit of venture capital under its belt, don’t be surprised if monetization plans begin to creep into the picture. For more, find Remind101 at home here.